Happy 2018! 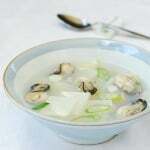 Did you have a bowl of tteokguk (떡국) on New Year’s day? 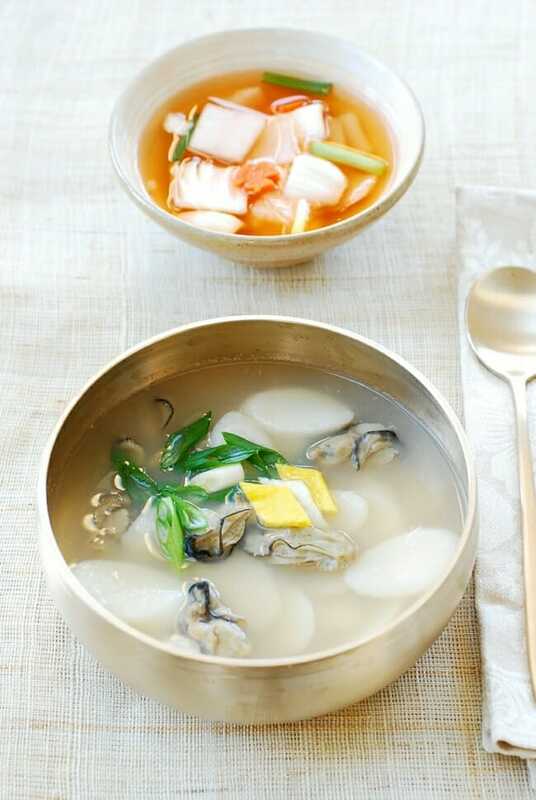 It’s a Korean tradition to eat this soup made with white oval rice cake to welcome a bright, prosperous new year. Don’t worry if you didn’t. Lunar New Year is coming up! 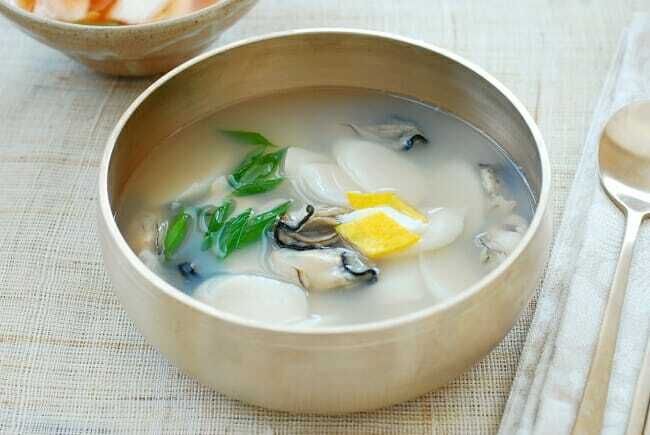 Tteokguk (ddeokguk or ddukguk) is usually made with beef broth, but I made it with oysters (gul, 굴) this year. After having so much delicious foods made with oysters in Korea last fall, I’ve been longing to use them more in my cooking. 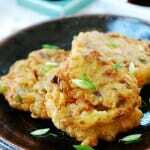 The strong briny flavor of the oysters plays off quite well with the soft, starchy rice cakes! For soups, I like to use small oysters. Chopped up oysters don’t look as appetizing as small intact oysters. I’ve been buying frozen oyster packages from Korean markets lately, which have been pretty good. They are from Korea, one of the world’s largest exporters of oysters. 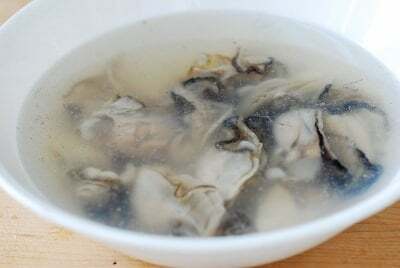 As I mentioned in my gulguk (oyster soup) recipe, oysters are packed with essential vitamins, protein iron, omega 3 fatty acids, calcium, zinc, etc. Highly nutritional if you’re thinking of healthy eating for the new year! Not a fan of oysters? Use clams or mussels instead. 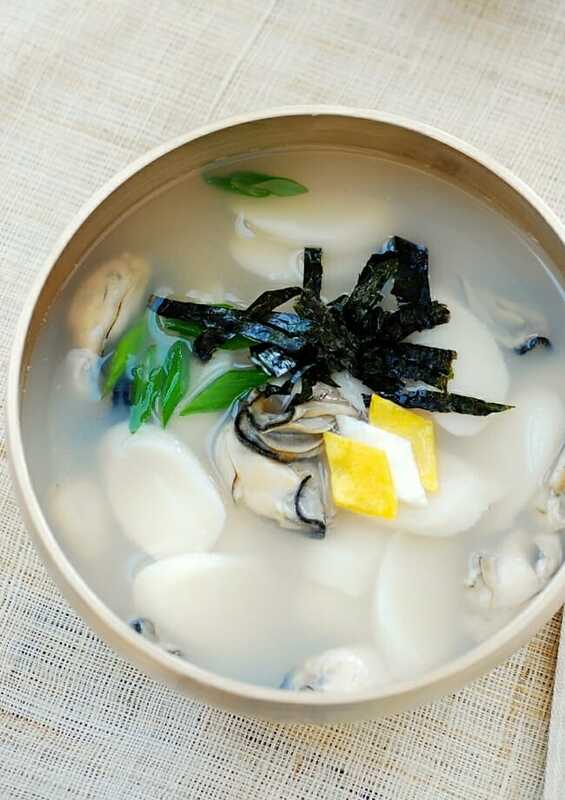 When I posted a photo of my oyster tteokguk on my Facebook page, a reader commented saying he made his with both oysters and mussels. That sounds great too! 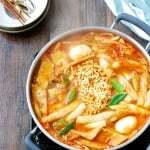 Sometimes, I parboil the rice cake slices separately in the boiling water before adding to the broth. This is a good way to keep the soup from getting too thick and starchy, if you prefer a lighter soup. Finally, I hope you and your family have a healthy, prosperous, and joyous new year with no shortage of great home cooked foods. 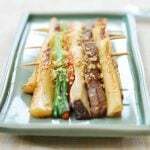 As for me, I’m always grateful that you allow me to be part of your Korean cooking. You can look forward to many more delicious recipes in 2018! 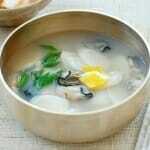 Korean rice cake soup made with oysters! 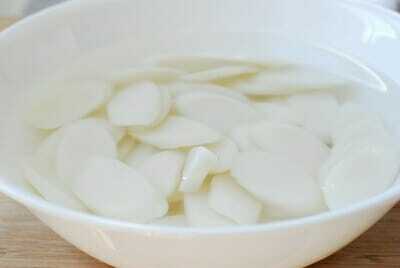 Soak the rice cakes in cold water for 10 to 20 minutes. 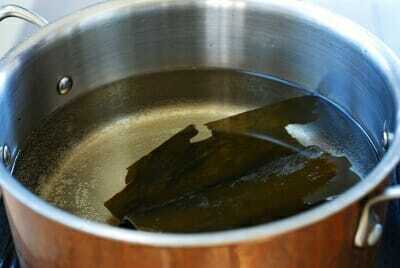 Add 6 cups of water and the optional dried kelp to a medium size pot. Bring it to a boil, and continue to boil for 5 minutes. 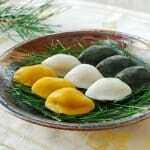 To make the optional egg garnish (jidan), separate the egg. Lightly beat the white by gently cutting it with a spoon. Stir the yoke with a spoon until smooth. Heat a lightly oiled nonstick skillet over medium low heat. 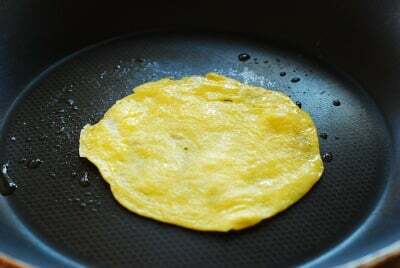 Pour each egg part into a thin layer, tilting the skillet and/or spreading with a spoon. 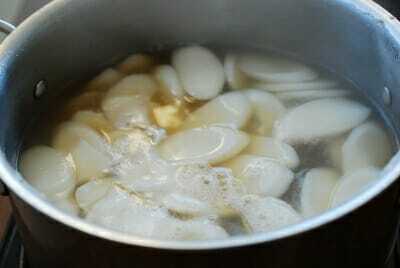 Cook each side briefly until no visible liquid remains. (Do not brown the egg.) Slice into small diamond shape pieces or short thin strips. Remove the kelp if used. 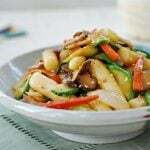 Add the rice cake slices, garlic and soup soy sauce (or fish sauce), and cook until very soft. Drop the oysters in. Cook for a couple of minutes after the soup comes to a boil again. Season with salt and pepper to taste. Remove the scum. 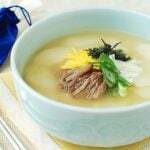 Ladle the steaming soup into individual bowls and top with the scallion and the optional egg and gim strips. 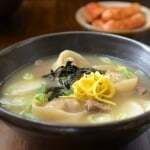 If you don't like your soup too thick and starchy, you can separately parboil the rice cake slices in the boiling water until soft, drain, and then add to the soup. I have cooked about 6 of your recipes and it has been amazing! 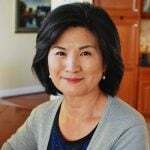 I grew up in Korea and your recipes truly remind me of my Harmony’s cooking! I’m looking for rice recipes now. Specifically the mixed bean/grain rice to substitute white rice. Any suggestions or even a blog post would be amazing! I also have a Korean pressure cooker.